Nimbus Themes / Magazine / WordPress Themes / 24+ Content Sharing WordPress Themes for Bloggers, Social-Media, and Many More! 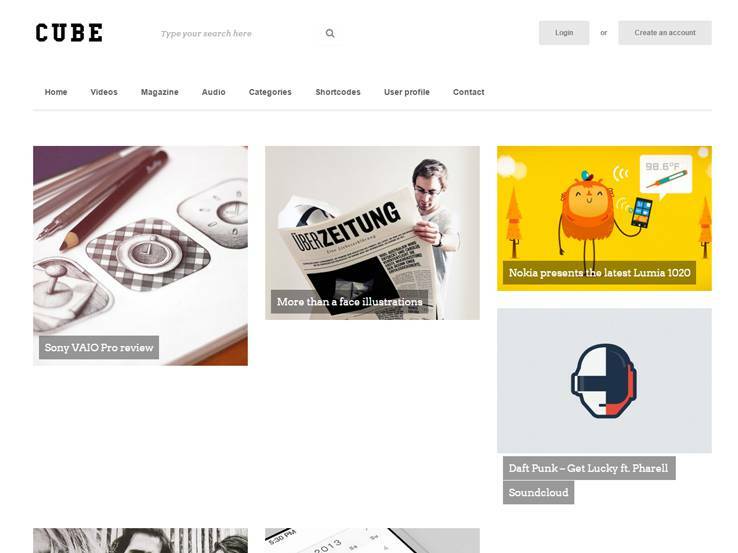 24+ Content Sharing WordPress Themes for Bloggers, Social-Media, and Many More! The idea of content sharing involves the process of finding cool articles, videos, images and other forms of media and distributing it to your followers. Many of these content sharing platforms don’t even make their own content, rather they use their website as an aggregation engine for people to come there and locate the best information on the internet. Who Can Benefit From Creating a Content Sharing Website? This works great for companies that may sell items on an eCommerce store, since it’s not always in the budget to generate your own content. At the same time, blogs have been known to build reasonable amounts of cash flow by bringing together the most useful information in a particular industry. For example, it’s not always the easiest to search on Google to discover articles about gardening, so if you’re a gardener, you may discover a content sharing website that does most of the work for you. If you’re looking to do something similar, it’s important to have all the tools required for uploading, editing and publishing your content. If you’d like to share videos, you’ll want embedding and uploading options. If you share images, it’s nice to have a fast theme with tons of spots to place your photos. Regardless of what content you want to share, the key is to discover a content sharing WordPress theme that cuts out all the tedious work involved with distributing information. We’ve done the work for you, so keep reading to find some of the best themes on the market for sending your articles and media into the world. The I Love It! WordPress theme has interesting settings, allowing you to stand out from some of the many other content sharing blogs online. One of the tools available allows you to organize blog posts based on a rating system. Users can come to your website, rate an article, and see some of the other higher rated articles for further reading. Keyboard navigation is available for quickly moving around, and Facebook commenting is automatically integrated so that people don’t have to create a completely new profile in order to participate in the conversation. Five post format types allow you to add some variety to your website and custom background images work wonders for branding your site and giving people a taste of your personality. Custom logo fonts are also available to make your site more unique. The I Love It! 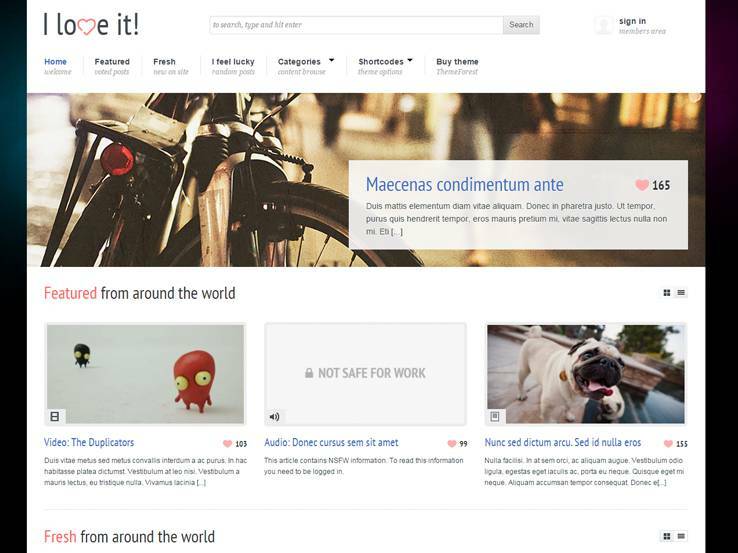 theme provides social media sharing buttons. This means people can come to your site and share the content they find most appealing. It’s a win-win for you and your customers. Over 100 shortcodes are included with the I Love It! theme, allowing you to easily add elements like buttons and columns. In essence, shortcodes are great for both beginners and advanced users since you don’t have to go into the source code to make advanced changes. This is a completely responsive theme that looks great on mobile devices and the search bar at the top ensures that folks can quickly locate the articles they want. Several widgets are also included with your purchase, helping you add modules for latest tweets, latest posts, contact forms, and more. If you’d like to share your content in a professional and fun manner, the I Love It! theme is a good place to start. The Serpent theme is marketed as a social network theme, but it works rather well for admins who are really interested in developing a social network with lots of content sharing. All of the featured posts are established by a voting system. So, similar to the theme we talked about above, people can come to your site and decide whether they like the content. Better content gets placed at the top, and the lower-rated articles go to the bottom. The keyboard navigation is a nice touch and hundreds of shortcodes come in handy for those who want to keep their hands free of any coding. Social media sharing is a notable feature of the Serpent theme, considering most content becomes popular online when shared on various social media platforms. Custom logo fonts are great to have around and the background images are easy to manipulate for branding your site. Facebook commenting is included with the Serpent theme and keyboard navigation means that users can easily move around your website. Users can also submit their posts to see if other people like them as well. The responsive nature of the theme means that anyone can see your website no matter which device they’re using. The user profile page is one of the most powerful we’ve seen since it allows you to manage user accounts, submitting articles, and keeping track of users. You can even implement a slideshow to feature more interesting content that ends up on your website. 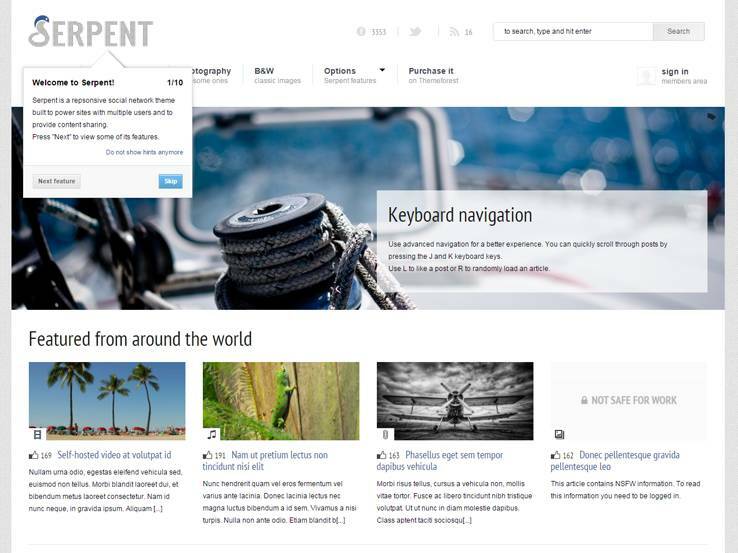 Along with social media ready options and a fairly modern design, the Serpent WordPress theme has some pretty cool tools for getting you started with your content sharing journey. The Ultrahumoor theme is not one you’d see on other lists, but it comes out as a front runner for content sharing since it connects images and social sharing. The main idea behind the theme is to allow other people to post images on your website on top of you creating the content as well. Then, users can log in to your site and share the content with other people throughout the internet. The mobile responsive layout is ideal for users who prefer using their mobile devices to read interesting content online. The theme is set up to look similar to imgur, and it helps people post their images in a blog-based format. Other users can comment or vote to see which of the images are going to be featured on the homepage. Social media sharing buttons are provided at the top of every post, and a beautiful header includes a logo upload area and some navigation options for keeping people on the right track. A search bar is included in the sidebar and a related posts widget shows details about the posts along with small thumbnail images to prompt clicks. A large submit button can be placed in the sidebar to encourage your website visitors to submit a pic. The theme also includes a beautiful comments section, which is often considered a must-have for running a successful content sharing website. When users go to the “submit a pic” page, they are met with several fields for things like descriptions, names, uploads, and credits. People even have a chance to credit their images to keep things legal along the way. If you’d like to make a website similar to Imgur, but you have a better idea that could make it more unique, consider going with the Ultrahumoor WordPress theme. 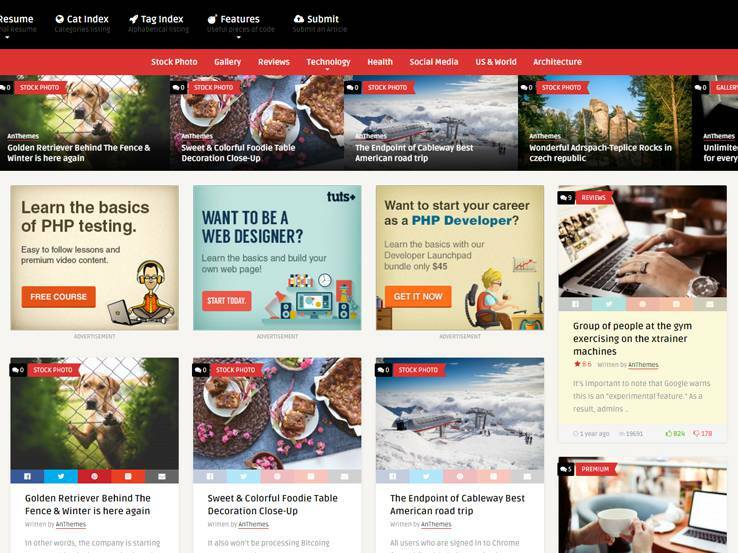 The El Toro theme is built as a responsive portfolio theme, but it works great for sharing content and connecting people who are interested in similar types of articles and media listings. On the backend, you’ll find a drag-and-drop main page builder, which comes in handy for those who don’t have any coding experience or even for designers who need to set up a client website quickly. Custom header types are rather nice and five menu styles add some variety to your site while also making navigation as easy as possible. All of the featured posts are determined by a voting system. As you’ll notice from some of the content sharing themes highlighted above, the voting system is a mainstay in the content sharing world bringing together a community of people who decide what they deem worthy of sharing. The keyboard navigation makes it even easier to navigate the website, while the Facebook commenting system integrates flawlessly with the theme, allowing users to avoid creating a separate login for your website. Feel free to change your background images and colors and rest assured your website will look great even on smaller devices. The El Toro theme has a wonderful animated slider, which provides text and image options where you can include a brief description of your website or even showing off some of the newest articles. The logo sits in the middle of the header and the portfolio is yet another way to provide plenty of content to share with your audience. A blog is also provided with the El Toro theme, boosting your search engine rankings and allowing you to highlight the top voted content. 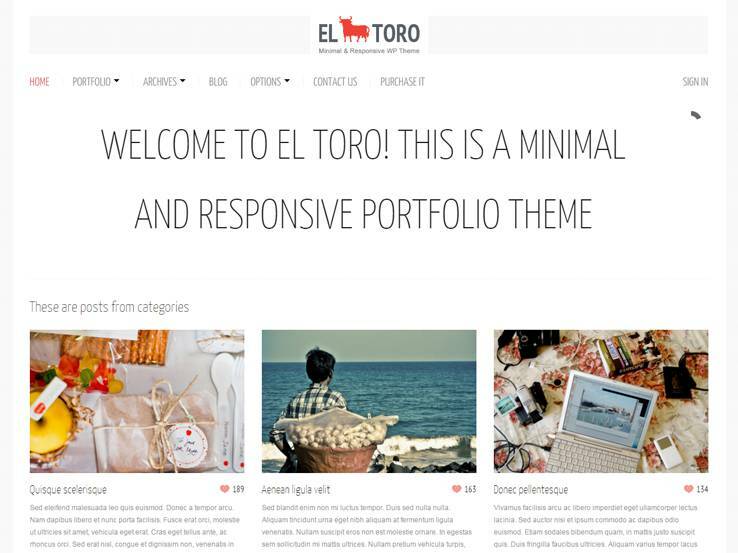 Therefore, consider the El Toro theme if you’d like a clean modern look on your content sharing site. 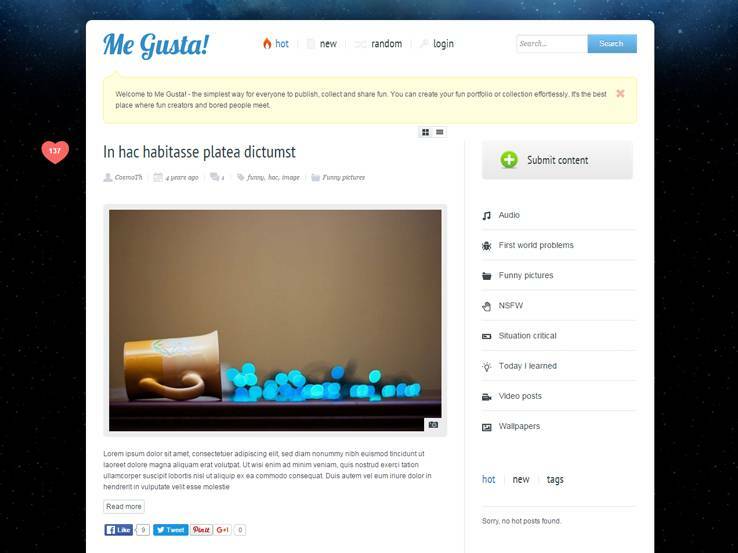 Looking for a more creative content sharing website with lots of colors and settings? 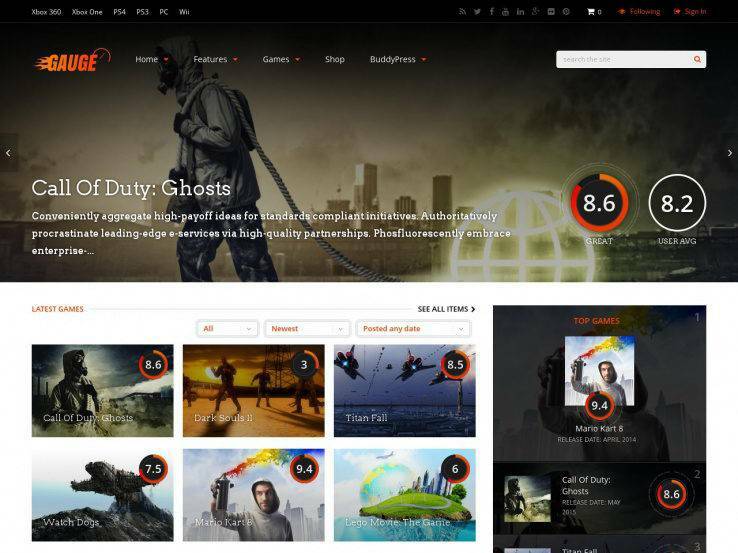 The VideoBox WordPress theme is an interesting theme to look at, considering it can be used for more playful industries like gaming and movies. What’s cool is that stock photos are included with the purchase, so you don’t have to immediately start off with images from your own database. This is essential for getting your site up and running and creating an impact on the people who are going to be your future followers. 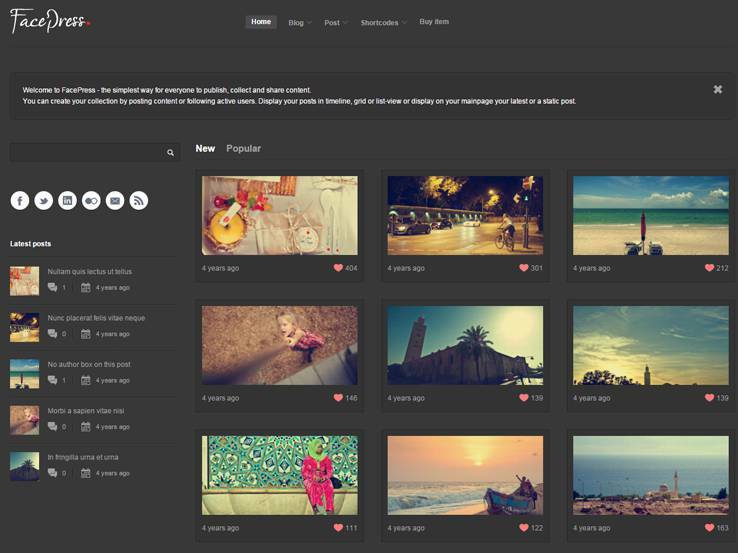 You have the ability to upload and share photos and videos, both of which are managed on the WordPress dashboard. If you have a portfolio, the VideoBox theme provides a few grid-based solutions for changing the number of columns on it. Two navigation menus are customizable towards the top of the page, while quite a few widgets are used for creating the overall look and feel of your homepage. One of the widgets is used primarily for social media buttons. You can place them in a sidebar or footer and send users to places like Facebook and Twitter. A list of your most recent blog posts is a solid choice as one of the widgets. The majority of your videos are displayed on the homepage as well, which means users see how many other people liked and viewed the videos. It almost looks like Pinterest, considering the entire homepage grid is constructed in a similar way. 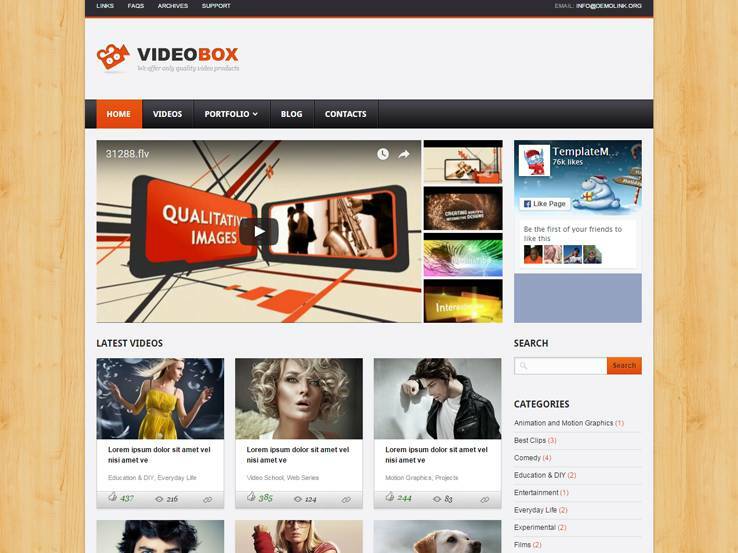 Along with a search bar, category widget, and archive list, the VideoBox theme is a widget-packed solution for your video needs. 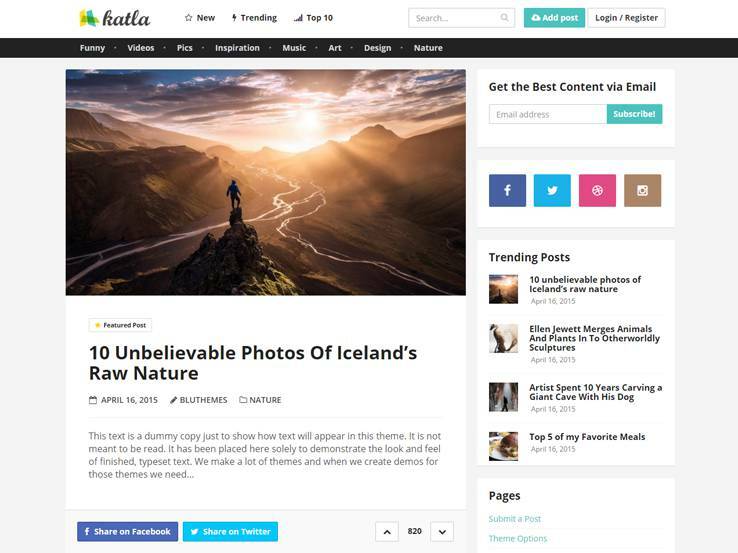 Katla is a striking theme that’s a great choice for anyone who wants to create a user-generated content website. The theme has all the right features needed for your visitors to submit content to your website, while you manage it all on the backend. After someone submits a post, it goes into a queue pending review and goes live the minute you or your moderator approves it. Users and visitors can easily log in to your website with social media and each visitor gets their own profile where they can keep track of the shared content. Each post includes sharing buttons to help your content go viral and readers can easily upvote and downvote posts. A custom menu makes it easy to display different content categories and a search bar makes it easy to find relevant posts. The theme can be customized through an easy-to-use theme options panel where you can style every aspect of your website. Email signup form makes it easy to grow your email list and notify your readers about new content so they can keep coming back to your website. The Katla theme is also fully responsive and AJAX loading will keep your website fast. 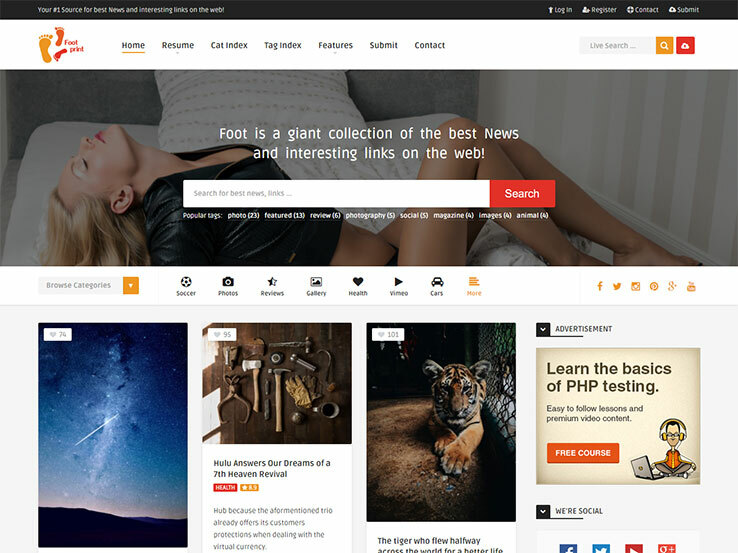 Along with complete social media integration, SEO support, and multiple homepage layouts, the Katla theme is definitely worth checking out. Me Gusta! is a great theme for anyone who’d like to share a variety of different types of content on their website. The theme includes support for video, audio, and image content and users can easily submit their posts from the front end, edit them, and even delete them. The stand out feature of this theme is the ability to allow readers to love your posts. Once a certain amount of love is reached, the post becomes “hot”. You can then prominently feature these “hot” posts on the homepage. Keyboard navigation is another notable feature which facilitates navigation. This theme also allows users to login via Facebook and all the posts have built-in social-media share buttons that users can click to promote your content. Unlimited sidebars are included so you can include various widgets such as category lists, a content tabber, recent posts, and more. Mega menus are nice for including lots of content into your navigation and over 100 shortcodes help you add anything from buttons to columns without touching a single line of code. The theme options panel has settings for customizing your colors, fonts, and more and the responsive design will ensure your content is accessible even on smaller devices. Share It is a unique and creative theme with a stunning front page reel that reveals your most popular content. The theme includes 5 different homepage layouts and comes packed with features and customization options. More than 300 customization options are available, along with 30+ post customization options. The theme also features 5 different background options to highlight your content, with parallax effects being one of them. A unique feature of this theme is the timeline-like layout of the content which makes it incredibly easy to scroll down your page. Facebook and Disqus comments are included with the theme, while Google Fonts make customizing the typography a breeze. Visual Composer provides a drag-and-drop interface for customizing your layouts and the responsive design ensures your website looks great on just about any device. Social media integration is included with the theme, so give Share It a go if you want to stand out from the crowd. Having a fixed header and sidebar, Aruna offers a three-column homepage to feature your latest content. If you are looking for other styles, feel free to check out all five home page designs. You can publish posts in seven different formats, while the readers can submit their posts by using the front-end posting button. Aruna’s impressive keyboard navigation will jazz up your website’s user experience. Built-in social sharing and bookmarking options will help the visitors to share and save their favorite posts. The lightweight template uses lazy loading to ensure the best performance of your content sharing site. 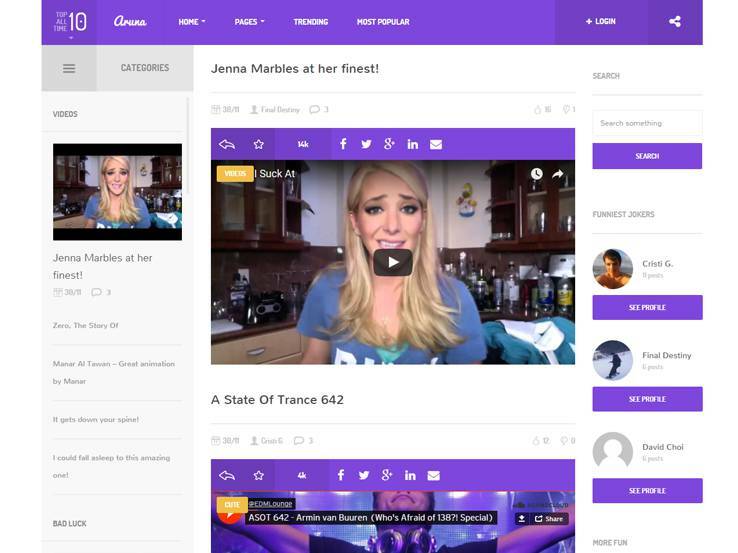 Being a community-based content sharing theme, FacePress presents a traditional design to showcase the available content. You can choose from the timeline, grid, or list styles to display the posts. For the basic website structure, it is possible to stick with the fixed size or go with the liquid layout. Ready-made templates along with the custom galleries and maps integration will come in handy to decorate the various pages. The professional registration and login forms will allow the users to create profiles on the site. Once registered, they can edit their profile and follow, unfollow others. With a magazine-like appearance, Foot enables you to display the content in the regular grid, masonry, Pinterest, magazine, or full-width style. 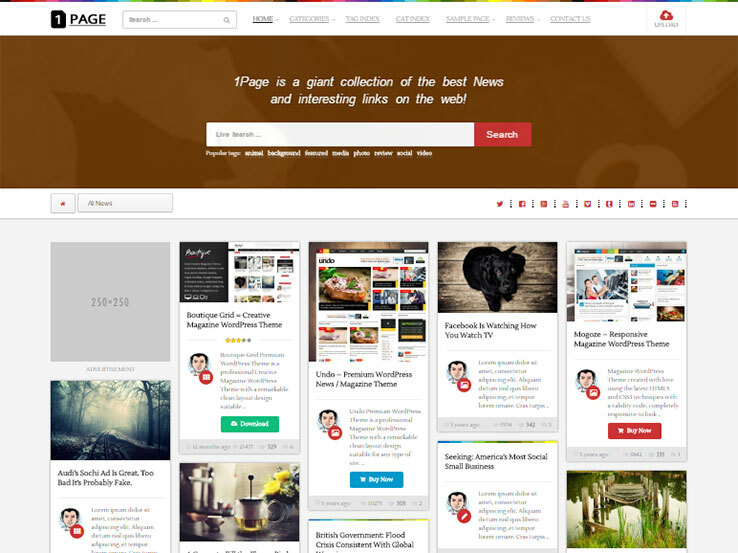 The large featured posts section will be the perfect place to show off your best content. Built-in live search and sticky header will enhance the visitors’ browsing experience. There are 10 custom-made widgets along with multiple ad sections to decorate the sidebar, footer, and other widgetized locations. Fly-out mobile navigation will make your site look great on smaller screen resolutions. Foot also comes with the whole set of XML demo data, allowing you to get started within a short period. 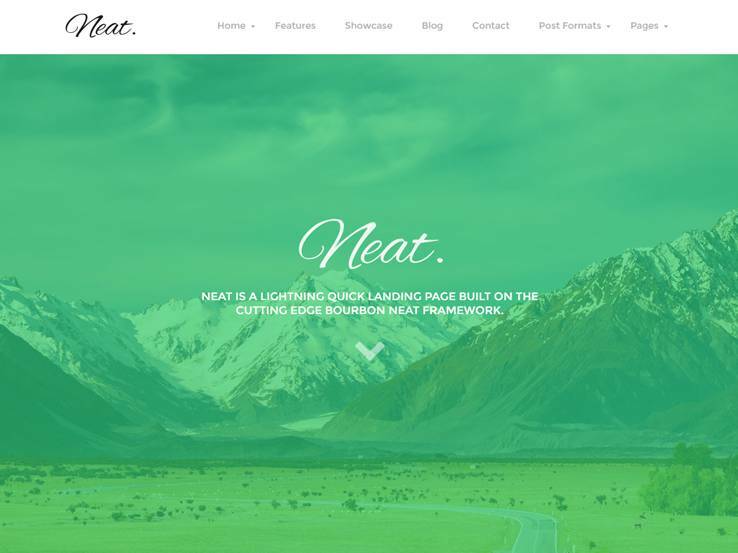 As the name implies, Neat provides you with a simple, minimal layout to showcase the content in an elegant way. The one-page structure can accommodate all the latest and popular posts on the homepage, while it is also possible to have separate pages for the blog, contact us, about us, etc. The powerful combination of Visual Composer and Revolution Slider will make it a lot simpler to create eye-catching outlines. Alternatively, you can get started with the inbuilt post and page templates. Parallax backgrounds and touch-friendly carousels will ensure an outstanding browsing experience for your audience. The modern, impressive design of Cube makes it an excellent choice for sharing automobile, technology, or lifestyle content. It features four homepage variations along with the option to create a custom front page layout. Thanks to the Retina-ready interface, your content-based site will look great on all screen sizes and resolutions. Visitors can submit their content by using the front-end submission panel, like other posts, or join the conversation with their Facebook or Disqus account. Other notable features include extended author profiles, unlimited colors, Google Fonts support, and an AJAX-based contact form. Despite being a top-rated game and tech review theme, Gauge can also be used to build any content-centered website. It has various sections and hubs so that you can show off different types of content. Readers can sort the content by applying various filters like the category, date, publishing time, and so on. The robust menu configuration options enable you to add posts, columned structure, and define the menu visibility. Gauge is provided with full BuddyPress and bbPress integration, which means the visitors can register and use the front-end post submission feature. The name indicates that this specialized theme will help you to develop you a Pinterest-style blog or content sharing site. Its prominently located featured articles section will allow you to highlight the most popular posts in a stylish way. Regular readers can use the social login and front-end posting options to create, edit, and delete posts. Full Copyscape integration will prevent them from publishing duplicate contents. You can display third-party ads on any or all of the spots and earn some extra revenue. Uploader greets the visitors with a large hero image. Below, there are several ways to browse the media collection by using the categories, content type, or search for particular contents. The integrated membership system will allow them to register and upload their own media, set up playlist, and customize the profile. You are free to use any of the default player skins or build custom ones from scratch. Also, don’t forget to check out the inbuilt layout editor to create unique post and page designs for your site. The superior options panel includes all the styling features you need. 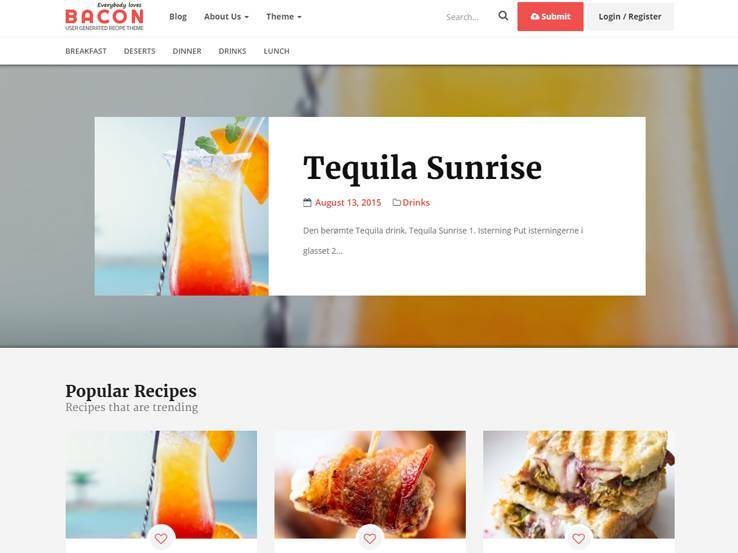 If you are looking for a clean WordPress theme that enables you to feature different types of recipe and foodie posts, Bacon should be one of your top choices. It provides additional information like the approximate cooking time and the number of ingredients for each recipe. The social login option will come in handy for accepting the user-submitted recipes. Visitors can choose from the 20+ social networks or use the front-end login form. They can customize their profiles and like the recipes submitted by other users. Bacon also comes with a live Instagram feed, Google captcha integration, and an AJAX-powered interface. Here’s another Pinterest-inspired content-based template that allows the audience to enjoy their favorite Pinterest features in a material style. They can pin images, create boards, categories, and tag places by using Google Maps. Interested people can log in by using their Facebook or Google account. Registered users can edit their profile and follow others. Pinty comes with a unique fetching option to retrieve images from custom links, YouTube videos, and public Facebook posts. The pre-packaged demo content and detailed documentation will help you get started quickly. This colorful WordPress theme is specially created to display audio, video, and other types of multimedia content. 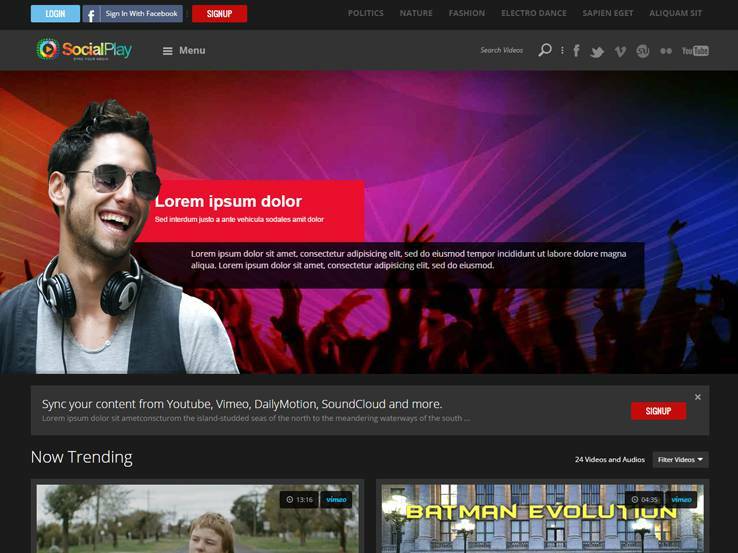 SocialPlay features a powerful page builder and Revolution Slider to help you create attractive layouts. The handy media synchronization works with all the regular platforms like YouTube, Vimeo, and SoundCloud. Regarding the styling options, SocialPlay enjoys several color schemes, background patterns, typography, and lots of other personalization choices. It is also possible to get started with any of the ready-made page designs. Pinfinity combines the power of Pinterest and Tumblr in a single package, allowing you to share interesting content with your visitors. 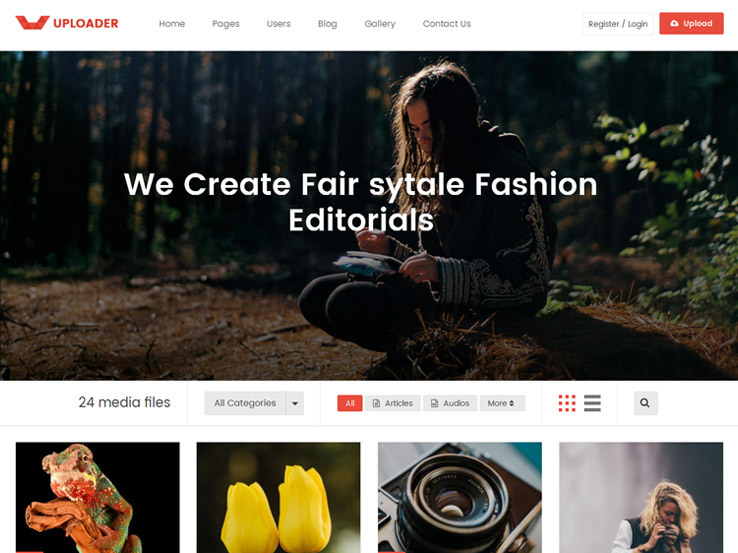 As the theme works correctly with all the standard page builder plugins, you can create stunning post and page layouts with your favorite drag-and-drop builder. The built-in infinite scrolling will automatically fill up the page with fresh content, while the customized post formats will take care of the styling issues. Readers can like any post by using the dedicated button. The translation-ready template could be an excellent choice for creating content sharing sites in other languages too. 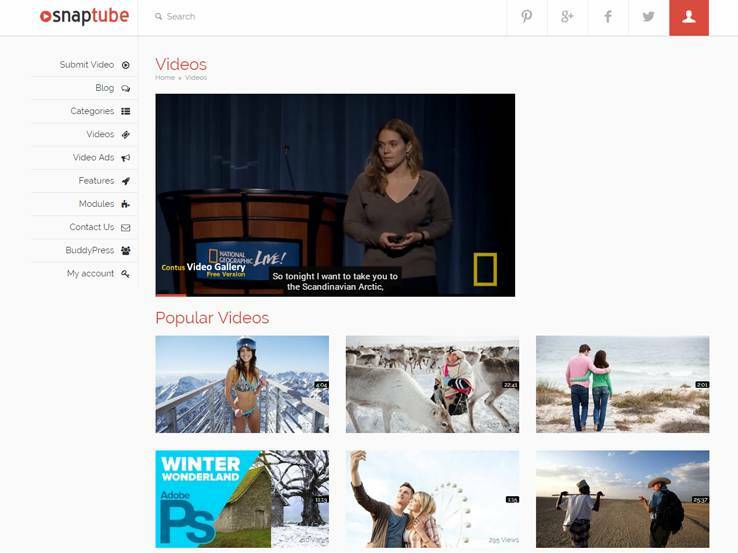 Video sharing websites require special designs like the one provided by Snaptube. Its drag-and-drop modules enable you to create any layout you want. The advanced options panel will provide you with the necessary styling choices. 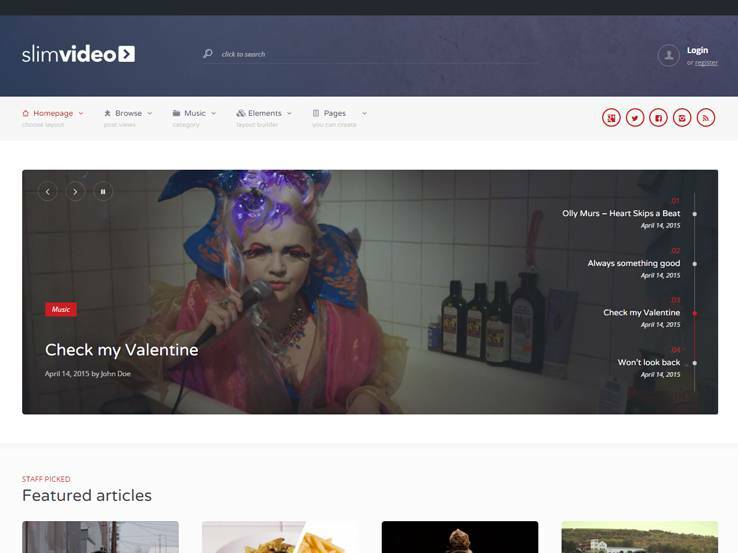 Being a video-based theme, Snaptube allows you to embed videos from popular sources like YouTube, Dailymotion, Vimeo or use show self-hosted videos. You have different ad choices including pre-roll, post-roll, mid-roll along with ad skipping to show advertisements with the videos. Also, make sure you are taking advantage of the configurable player skins. Featuring infinite scroll in a masonry style, 1page is a highly optimized WordPress template for sharing news, updates, or interesting links with your visitors. The five-column design will be more than enough to keep the readers busy with a fresh flow of content. All of your posts will be displayed with view counts along with the number of likes and comments. Enable the sticky sidebar and header to make it easier for the audience to explore other content. The unique tag and category index pages will also be a great way to find out more content about a specific topic. The specialized Slimvideo theme could be an excellent choice for publishing video, audio, or regular blog posts. It is provided with 55+ builder elements for creating personalized content layouts. With advanced mega menu support, you can add all the necessary links to the main navigation menu. There are seven additional post types along with several styles to display the posts and single videos. Use the custom widgets to decorate the widgetized places. Unlimited header and footer customization options will help you deliver a satisfying browsing experience. As the template works perfectly with WooCommerce, offering premium membership plans is also possible. 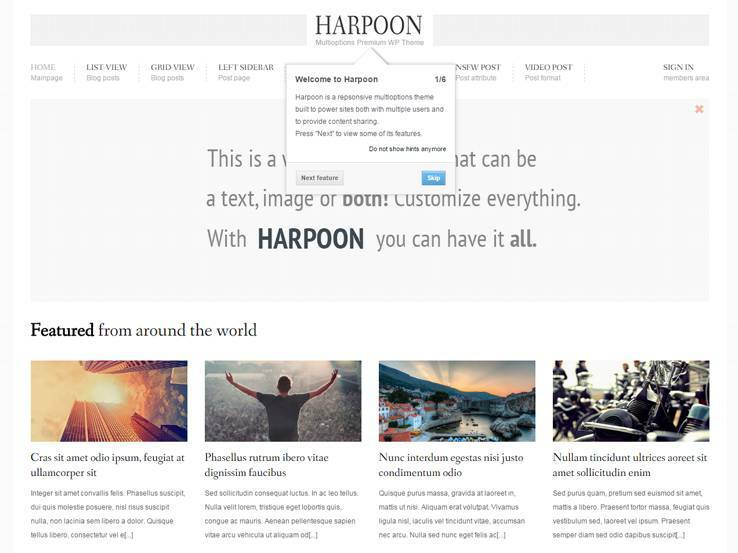 The simple, minimal layout of Harpoon will help you to develop sites with a complete focus on the content. Choose any of the six menu variations and three header types, while the 100+ shortcodes and lots of ready-made backgrounds will help you customize the posts and pages. Make it easier for your visitors to use the website by enabling keyboard navigation. Integrated Facebook comments will encourage them to join the conversation. Registered users can edit their profile and like the posts. Harpoon also comes with premium goodies like tooltip helpers, unlimited sidebars, social sharing buttons, and related posts.